I dropped by Sam’s Farm in Falls Church, Virginia on Leesburg Pike (address at the end of this post) and was impressed by the beautiful decorations and trees they had there, at very good prices, too. 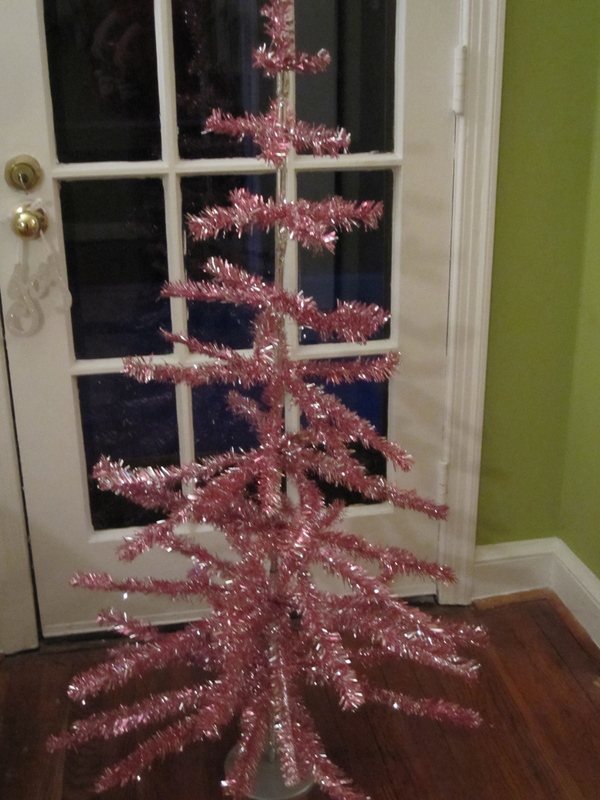 Even though I have a lot of Christmas decorations, I could not resist this pink tree for my bedroom. My bedspread has pink dots on it (imagine a Barbie bedroom and you would not be far off) and this tree will be perfect. The price was perfect, too. All the artificial trees are marked down half-price. So I got to take home this $25 tree for only $12.50, plus tax. They had some beautiful shades, including silver, gold, platinum, white, pear and lime green, purple, and soft blue. Not on sale but a very good value were the most beautiful and healthy looking poinsettia plants I have ever seen. I have my eye on one that is a soft rose coral color. It was immense and only $19.99. They had a range of prices for the poinsettias (some larger, some smaller). I was also impressed with the artistry of the decorated wreaths, garlands, and centerpieces. They were exquisite, with fresh greens bedecked with magnolia leaves, floral picks and ornanments, lights in some cases, and lots of ribbons. Gorgeous! They were not on sale, but for the work and detail in these items, I thought they were quite a good value. They would be just the thing if you are entertaining, or if you have an office or restaurant and want to really impress your visitors.